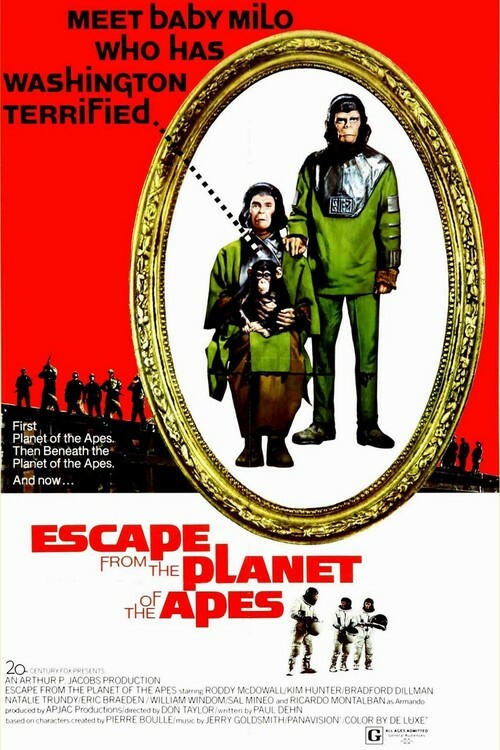 Set in 1973, two years after the year of release, the apes land and initially appear as astronaut – until they take their helmets off. They remain silent because humans may see them as a threat. Outspoken Zira cannot ignore her feelings and its not long before the role-reversal starting point of the film takes a left turn and the apes and humans communicate happily in English – the language that ‘everyone’ speaks. Indeed, the apes know no other language. 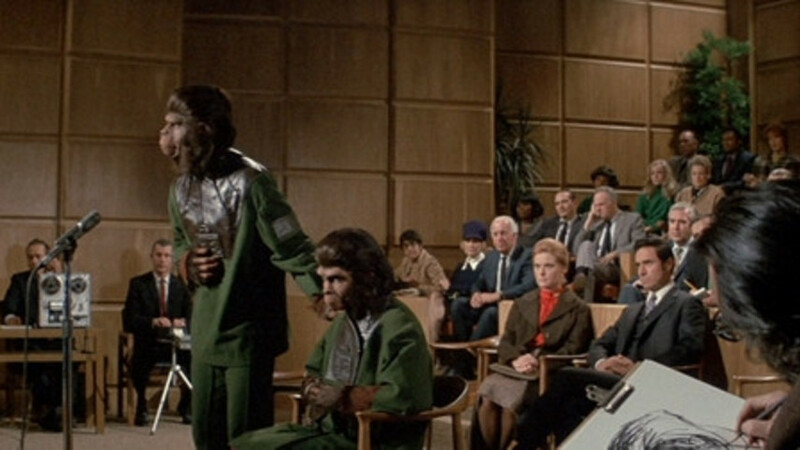 Zira and Cornelius are questioned by the presidential committee and, initially reluctant, the Apes manage to talk happily about their experiences – but hold back vital information which may incriminate them. Vitally, their knowledge of Taylor and Brent – and the destruction of the Earth. 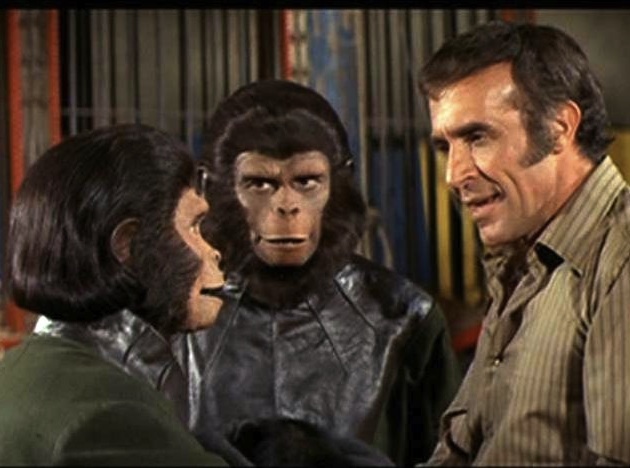 The apes know they are from the future and the knowledge that earth will be destroyed is not something you want to discuss when you first arrive on earth. Instead, following the committee, Zira and Cornelius become celebrities. They change their clothes, begin to enjoy ‘grape-juice’ and our world begins to influence who they are. Except one man doesn’t trust them – namely Dr. Otto Hasslein (Eric Braeden). If, like me, you are watching these films post-viewing of Rise of The Planet of the Apes, then you could argue that the story becomes inconsistent. The sacred-scrolls are what dictated the history of the apes and we see that they are now attempting to loop the time-warp element, as if the child of Zira and Cornelius became the first ape, raised on earth, to begin the dominance of the planet by apes. Cornelius expains how the first word uttered was ‘No’, whilst apes also began to understand the “concept of slavery”. Unlike the first two films, whereby it seemed to be subtext regarding religion and blind-faith, this film begins to set-up a subtext regarding racism, and specifically associating this with slavery and thus, racism against people of either African or Carribbean descent. This is much more overt in the fourth film, but it is set-up here. This is further explored as we see a fear amongst others of something they do not understand. Akin to David Lynch’s The Elephant Man, the apes become treated like circus attractions – whereby parties are held in their hotel room and others joke and, to some extent, mock them. We are even introduced to the use of the term ‘monkeys’ – and how this is offensive. Most importantly, we can see the distrust Zira begins to hold towards all human – through the actions of the few. That fear and distrust works both ways – and it is understanding and honesty which ensures change. The rise of the apes, in terms of the ‘original’ rise, was only turned into a film last year and these first five-films all show the consequences of Taylor’s time-warp and visit to the Planet of the Apes. Zira and Cornelius are starting a different time-period by arriving on earth in 1973, which we see more-of in the next film. The ‘Scared Scrolls’ are semi-accurate documents about the beginning and, much like th New Testament, there are discrepencies which, in and of themselves, prove certain truths. In fairness, all of the information Cornelius recalls is in accordance to what is eventually shown in Wyatt’s Rise of the Planet of the Apes. The crux of this film is established later in the film. Initially we are simply keen ot see where the apes visit will lead – and how it will affect earth. And, simply through his sinister looks, we know we cannot trust Dr Hasslein. But his actions are much more confusing, as he realises that the earth will be destroyed in 2000 years – and (a) wholly believes it without question and (b) decides to ‘protect’ the earth from the destruction … in 2000 years. The only solution is to kill the unborn child Zira is carrying (advertised on the poster as Milo … but is named Ceasar in Conquest of the Planet of the Apes). Hasslein, again, represents the destructive nature of the human-race – whilst a fleeting visit to a circus (a clear connection to the ‘circus-nature’ of the Apes visit to earth) and Senor Armando, show the humanity in the human-race. I have a hard time truly believing in Hasslein’s cause – as I simply don’t believe in the apparent neccessity to protect a future 2000 years ahead. Who says a different future cannot be established? This is indeed covered in Battle for the Planet of the Apes, but at this point, Dr Hasslein actively, as a lone-gunman, hunts down the Ape-stronauts, to stop a future he will never witness. In closing, as usual with these films, we need to end on an incredibly pessimistic note: Zira, Cornelius and the baby she holds are all shot and killed by Hasslein – before he himself is shot. A crane – or is helicopter? – shows the massacre. But these themes and attitudes are what place these films higher in credability than your average B-Movie Sci-Fi film. The stories present the deepest, darkest elements of mankind and how, using the Apes, our treatment of others needs to improve dramatically. But we do have a great progression to the story now as Senor Armando has a young speaking-Ape which he will raise himself. Naming the ape Ceasar.